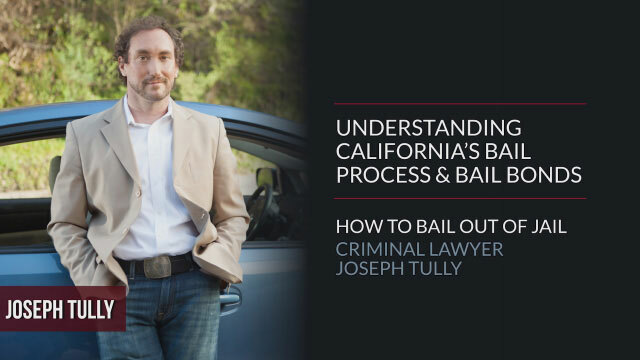 Joseph Tully, legal author and certified criminal law specialty lawyer, looks at how a California criminal defendant can use the bail process to get out of jail while awaiting trial. When people are arrested they understandably tend to panic. One of the first choices to make if somebody is arrested is whether or not to bail out. The process of bail comes to us from a history of jails wanting to make sure that someone shows up for their case. And, unless you’ve been arrested before, you don’t know how the bail process works. It’s actually pretty simple. I’m going to use an example of $100,000 just for the sake of simplicity. If somebody gets arrested for a crime and they’re in jail, the court wants to make sure that they show up for their court case. So, the jail says to the defendant, pay. If you give me $100,000, then I’ll let you out. If you go to all of your court appearances and your court case ends and the bail bond gets exonerated, then you can have your money back. That way, the court insures that a defendant shows up and the defendant gets out of jail. Because most people don’t have $100,000 cash sitting around, they would go to a bail bond agency and the bail bond agency puts up the money for you to the jail. But, whereas if you can pay the money yourself, you get it all back at the end of the case, with a bail bond agency, they will charge you a certain percentage. When you sign up with a bail bond company, you’re signing a contract and the contract is binding. So, if the prosecution decides never to press charges, two days later, a day later, because you’ve signed the contract with the bail bond company, you won’t get that money back. The contract is to get the defendant out of jail at that moment. Once a bail bond company does that, they’ve fulfilled their end of the contract. A lot of times California bail companies all use the same rates. So, really the only difference among CA bail bond companies is the quality of service and sometimes how closely they work with an attorney. One thing that most people don’t know is that if you have a private attorney, generally speaking, bail bond companies will give you a reduced rate. So, if you’re thinking about the bail process, you should probably consult with an attorney first, then the bail bond company. Believe it or not, sometimes it’s in a defendant’s best interest to not make bail. Sometimes it is, sometimes it isn’t. But an attorney will be able to critically evaluate the decision of whether or not it’s truly in a defendant’s interest to stay or jail or to make bail. That’s why consulting with an attorney prior to bail, not only will it give you a reduced rate, but you want to make sure that you’re making the right decision in deciding whether or not to bail out of jail. And that’s about it for the bail process. It’s generally a relatively simply process. It’s an agreement between either a defendant or family members to get a defendant out of jail while they’re awaiting charges. Again, I would highly suggest to speak with an attorney prior to the bail process. I wish you the best of luck.